Almost all of the biggest public galleries in London are entirely free, so you can be sure that you’re still going for the quality option, regardless of how much it costs. If you use your head and do a little pre-planning, you can benefit from the many free tours and guides that are available. There are a few exhibitions and galleries that do charge an entrance fee, but there are lot of free ones to get through before you even have to consider paying. 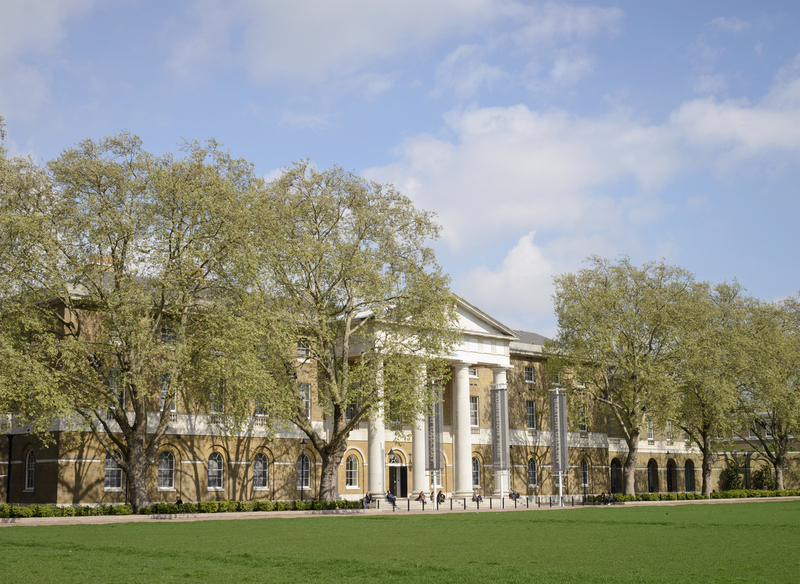 Officially reopened in October 2008, the Saatchi Gallery resides in the building formerly used as the barracks for the Duke of York’s army. The huge 70,000 sq ft gallery, is a full 30,000 sq ft bigger than the gallery’s County Hall venue. The gallery, is named after its proprietor and media mogul, Charles Saatchi who entered the world of art in the mid 1990s. The gallery itself became renowned for championing the cause for up and coming artists, such as Tracey Emin and Damien Hirst. 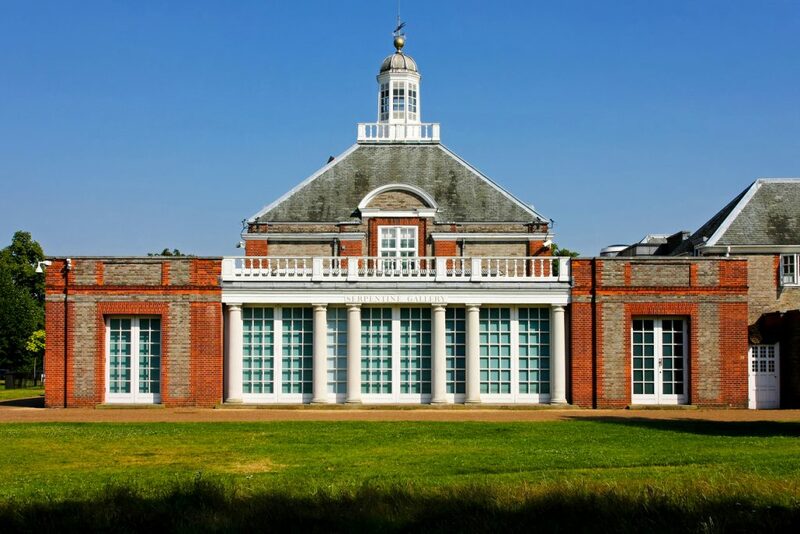 Whilst both are now considered household names in the art world, they began their journey here and the Saatchi gallery still to this day, has a dedicated area set aside for burgeoning young artists of today. Displaying works that are owned by the British public, this gallery is completely free to enter and is located at in Trafalgar Square, Westminster. 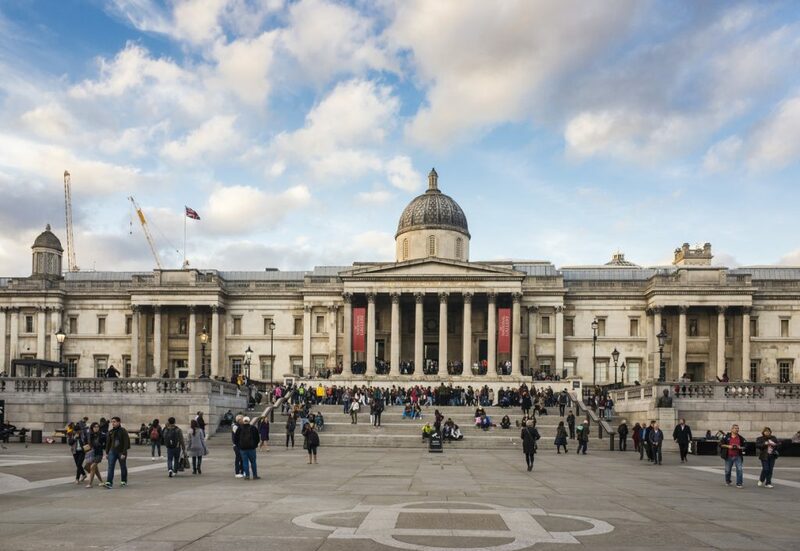 The National Gallery cuts a dominating figure over Trafalgar Square in London. This gallery dominates the landscape not only in size, but in world renown. Displaying some of the very finest pieces of art from across Europe over the last 750 years. Included amongst this magnificent collection, which numbers around 2,300 works of art, are John Constable’s ‘The Hay Wain’, Holbein’s ‘The Ambassadors’ and ‘Arnolfini Marriage’ by Jan Van Eyck. Other famous artists’ work displayed include pieces by Rembrandt, Van Gogh, Botticelli and Monet. If you are looking for an eclectic mix of styles and periods of art, then this gallery is the place to be. From Post-Impressionist work to the Early Renaissance, there is a painting on display representing each and every major stage of the development of painting as an art form. The gallery was established in 1824 by Parliament and as a publicly owned attraction, visitors are keenly encouraged to go and experience many significant works first hand. In keeping with this, the National Gallery runs regular free events, talks and tours, as well as not charging for entry. Everything is done to bring fine art to the masses. Guided tours are held every weekend at 11.30am and 2.30pm, with additional tours held at 12.30pm and 3.30pm on Saturdays. Lunchtime talks are also performed at 1pm on Saturdays and the visually impaired are catered for with ‘Art Through Words’ sessions at 11.30am on the final Saturday of each month. This gallery isn’t the destination of choice for seekers of serious works of art, judged on artistic merit, as the overall purpose of the National Portrait Gallery is to portray the sitter, not the creator. However, nowhere else would you be able to find Henry VIII, JK Rowling and Beatles all under one roof? 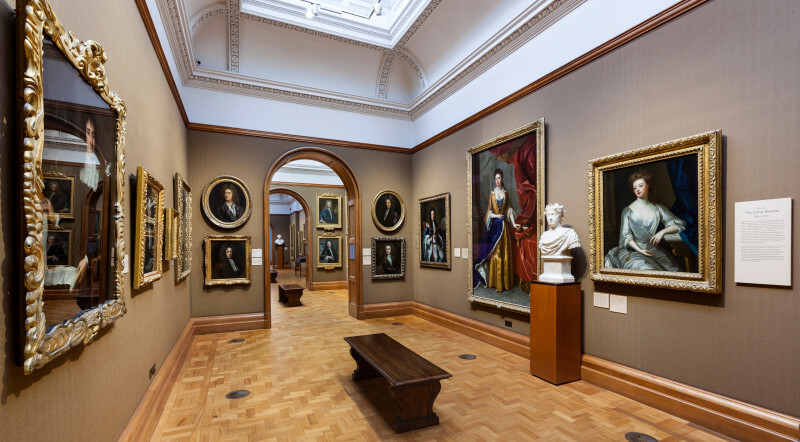 That’s not to say that there aren’t important works of art at the National Portrait Gallery, as it features acclaimed self-portrait work from notable artists such as Sir Joshua Reynolds and William Hogarth amongst the 10,000 strong portrait collection. From media barons to the showbiz glitterati, there’s a lot packed within its walls. This collection is representative of british culture and is arranged into different categories and themes, beginning with the Tudor period, right through to the modern age. Notable works to keep an your eye out for include – Hans Holbein’s cartoon depiction of Henry VIII, the only existing portrait of William Shakespeare and a sculpture of Queen Victoria with Prince Albert adorned in medieval costume. Featuring over 250,000 images, photographs, drawings, caricatures and sculptures, the National Portrait Gallery is the venue for the yearly ‘Portrait Prize’ competition and continues to be the best place to view contemporary art. 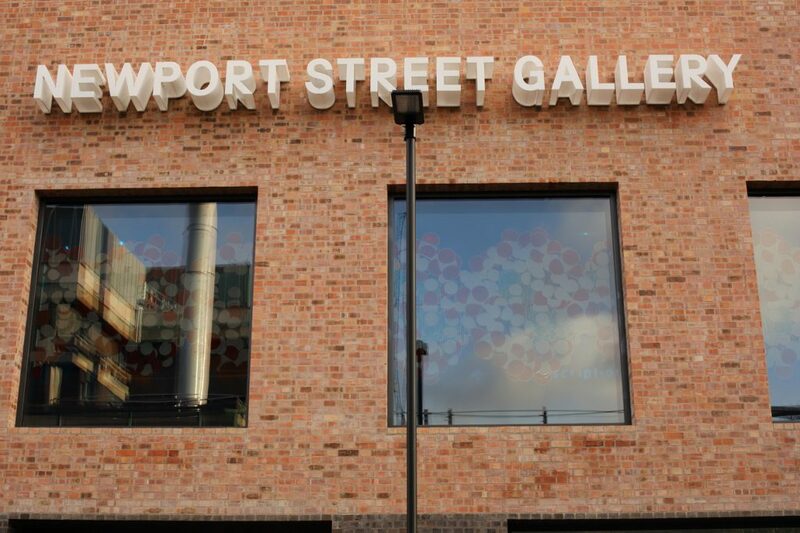 London, UK – December 11, 2016: The Newport Street Gallery was founded by well known modern artist Damien Hurst as a showcase for other young artists. Owned by acclaimed artist, Damien Hirst, this Gallery was built with one single purpose, to provide a home for his own collection of more than 2,000 works of art, that were previously held in storage. The huge gallery consists of 3 listed buildings and two new buildings that take up the entire length of Vauxhall Street. The complex was designed and created by Caruso St John Architects, who were also responsible for the £45m renovation of Tate Britain, back in 2013. Also included in the gallery are works by Jeff Koons, Francis Bacon, Banksy and Sarah Lucas. Damien Hirst once called it “My Saatchi Gallery” and he was delighted that this amazing collection is now longer hidden away in crates. Most importantly, it offers free events and exhibitions throughout the year. On the ground floor, the building is adorned by a glass wall, adjoining the cafe and outside photographic display space. At the top of the building, fantastic views of the Oxford Street skyline are to be had through its large windows and is a wonderfully rewarding and established gallery to visit. Anyone with even a passing interest in photography can’t help be transfixed by the displayed work, one of which is awarded the ‘Deutsche Borse Prize’ by the gallery itself. LONDON, ENGLAND, UK – JULY 24: Serpentine Gallery in London on JULY 24, 2008. Serpentine Gallery in centre of Hyde Park London, England, UK. This gallery forms the platform for the best in contemporary art in Britain and abroad and features an ever-changing exhibit. Permanent work in place consists of a tree plaque, 8 benches and a carved circle of stone by Ian Hamilton Finlay dedicated to the memory of Former Patron, Lady Diana Spencer, Princess of Wales. The venue is used for a yearly summer party, which is something of an occasion on the London party circuit and frequented by models, celebrities and fashionistas. From an artistic standpoint, more important that this is the Summer Pavilion, which requires a notable architect to build a temporary structure next to the gallery for the summer period and is said by many to be the most interesting part of what the Serpentine Gallery has to offer. Sitting on the banks of the Thames, the Tate Britain gallery was created by sugar mogul and philanthropist, Sir Henry Tate. The Tate is the fourth gallery of its kind in the UK, a group which includes the Tate Modern, also located in England’s capital city. The venue is home to the biggest collection of british art in existence and covers a 600 year period, from the turn of the 16th century up to modern day. Since opening, back in 1897, the collection has grown to include works by Rossetti, Spencer, Stubbs and Blake. It is also provides the venue for the Turner Prize award, the highest accolade in contemporary art. 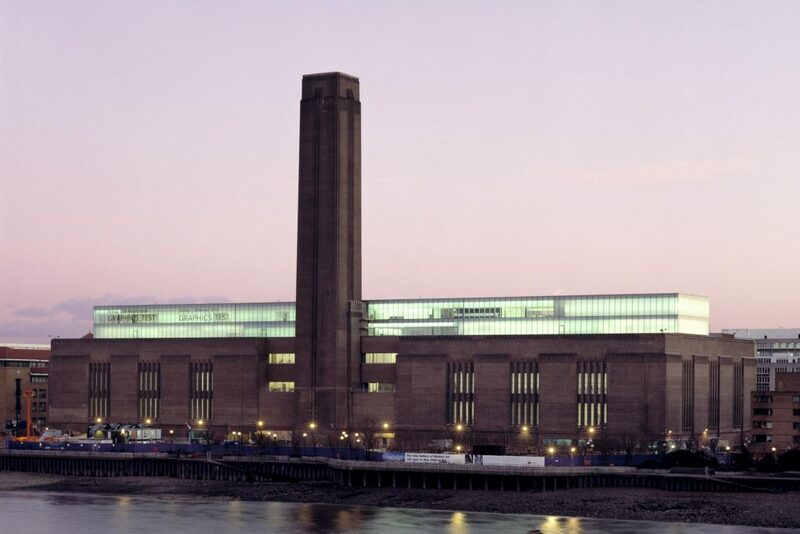 The home of the Tate Modern is the former site to Bankside Power station and is now home to art from the year 1900 through to the present day. Sitting on the banks of the Thames, the gallery was opened to much fanfare in 2000 and has since been visited by literally millions of people from across the world. If you haven’t been before, you should approach the gallery from Blackfriars and cross the ‘Blade of Light’ bridge. With St Paul’s Cathedral behind you, you will approach Turbine Hall’s intimidating doors and be presented with a fantastic modern masterpiece. Sculptures and temporary ‘installations’ can be seen here, some of which are on a grand scale. The gallery itself covers 3 floors and its most notable architectural feature is a magnificent two storey glass roof, offering wonderful views of London. Far from being a gallery for the adult connoisseur, it is actually one of the small number of galleries that can be enjoyed by children and teenagers alike. 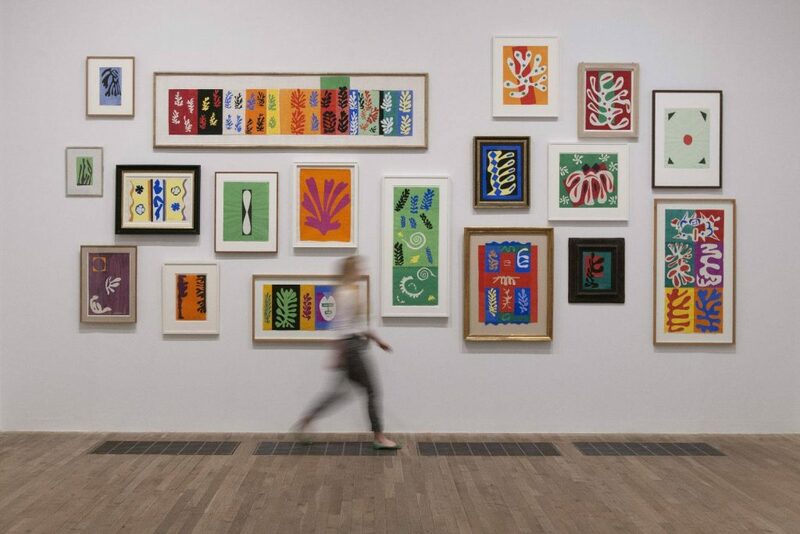 Notable artists displayed in the Tate Modern include Matisse, Picasso, Salvador Dali and Moore. It is arguably the most popular art gallery Europe has to offer. A visually striking addendum to the Tate Modern, which features an open-air viewing platform and underground chambers. 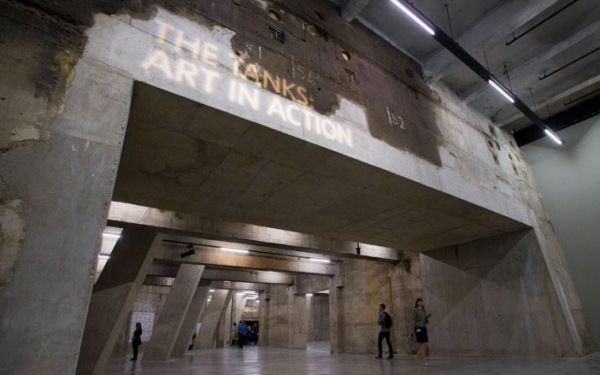 Opened in 2012 to tie in with the 2012 Olympics, it utilises old underground storage tanks to display installations, audio works and performance art. Costing over £200m to create, the rooms still carry the smell of the oil and industrial liquids they used to contain. Inside you’ll find many works of art, a restaurant, cafe and a room dedicated to the works of Louise Bourgeois. The best feature of the Tanks is its open air viewing gantry offering amazing view of the Thames and St Paul’s Cathedral. Free talks, tours and workshops are available at Hertford House, the former family home of Sir Richard Wallace and The Marquess of Hertford. The residence is adorned by Oriental and European works of great variety and style. Sculptures, miniatures and furniture from the 1700s can all be witness first hand with a visit to this gallery. The amazing collection which also features Sevres and Meissen porcelain, is the biggest held by a single family in existence. The collection as created, as the name would suggest, by Sir Richard Wallace, the illegitimate child of the 4th Marquess of Hertford. Sir Wallace inherited a much smaller collection from his father and was built up to include major works of art by Reynolds, Rubens, Gainsborough, Romney, Titian and Van Dyck. A collection to rival any gallery in London. Regular tours of the Wallace collection are available 7 days a week. 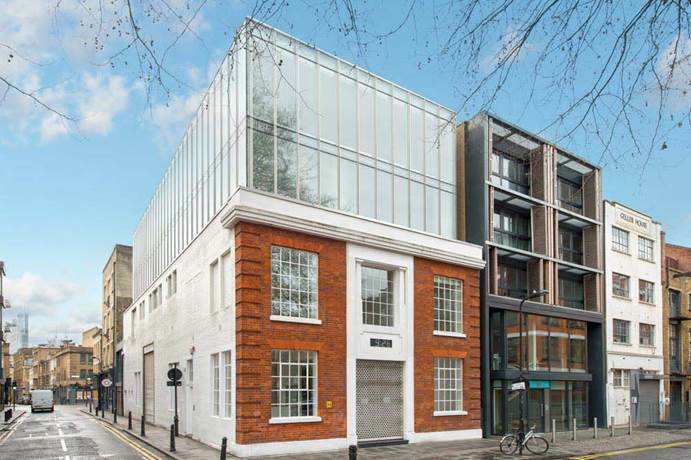 The biggest european commercial gallery consists of a huge 58,000 sq ft building, located on Bermondsey Street. Formerly used a warehouse in the 1970s, it is also the biggest of the Jopling ‘White Cube’ galleries. 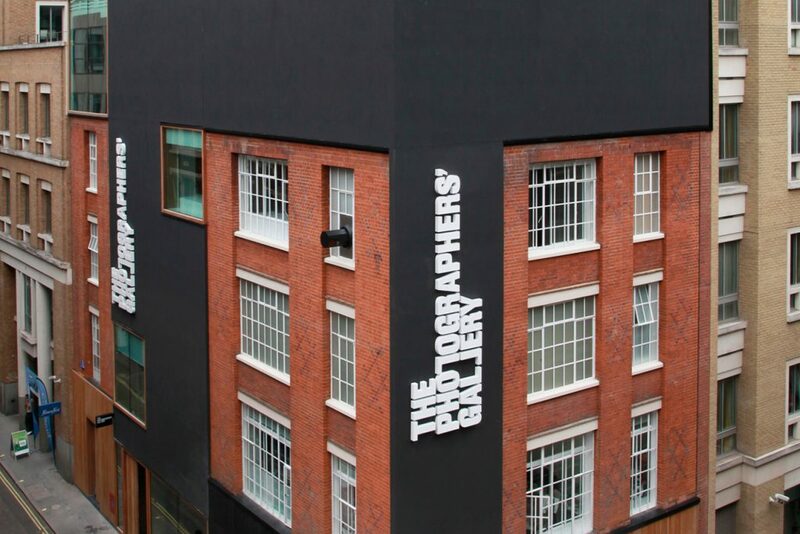 Opened in 2011, the gallery is well known and often used by the world’s most notable and richers purveyors of art. Created by Casper Kneer Architects, three large exhibition areas, private rooms for viewing, a bookshop and an auditorium. 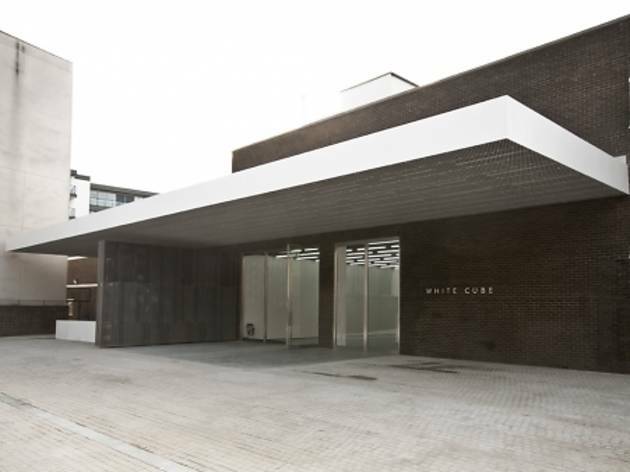 The White Cube offers constantly changing exhibits, displaying the very best in contemporary art. They also provide an educational program, lectures and artists’ films. A major part of the fashionable art scene in East London, the White Cube in Hoxton Square is home to some of the planet’s leading art and was the first of the Joplin White Cube empire. The gallery features work from preeminent artists including Hirst, Emin, Gormley and Dinos Chapman, to name but a few of those present. All of the White Cube galleries are completely free to visit. 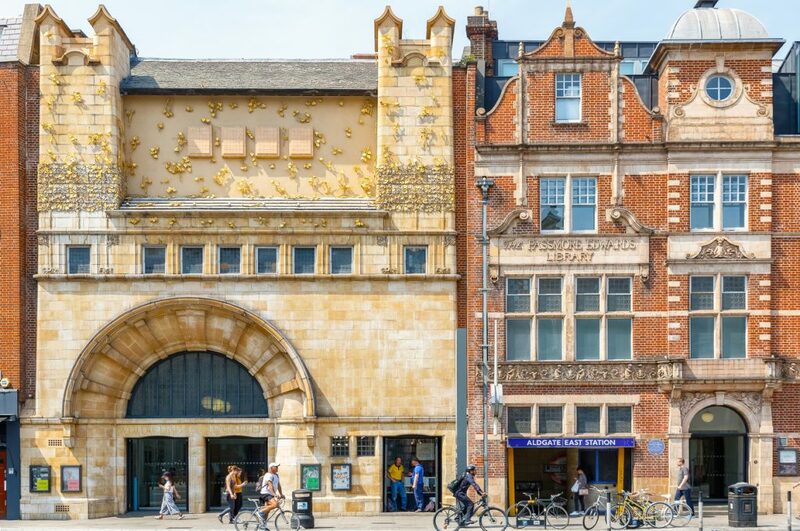 This is Britain’s very first purpose built art gallery and was created in the inimitable style of Charles Harrison Townsend, a famous 19th century architect. The building is renowned for it’s light and spacious interior and was doubled in size when refurbished in early 2009. Whilst there isn’t a permanent collection in place, it doesn’t need to, as it displays an ever-evolving body of work that is always a wonderful spectacle. In addition, there are retrospective displays and community projects as part of the greater exhibition. Jackson Pollock had his work exhibited in 1950s and ‘Guernica’ by Picasso has also featured in 1938. A venue for the very finest in the world of art.